The CD294 is a two-line, 32-character LCD for use with mixed-array data loggers. It displays one real-time value, a description, and units. The CD294 is mounted in an enclosure lid, allowing you to view data on site without opening the enclosure. PC294W software is included for entering descriptions, choosing units, and specifying up to 18 input locations to display. Two buttons on the CD294 are for scrolling through the specified values. The CD295 is a similar display that supports PakBus data loggers. 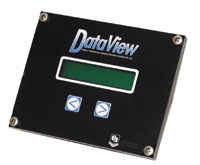 The CD294 DataView is a two-line, 32-character LCD that can display real-time data from a mixed-array data logger. (The CD295 is available for PakBus data loggers.) Mounted in an enclosure lid, the CD294 allows you to view data without opening the enclosure. With the CD294, you can scroll through up to 18 input locations to view the latest measured value, its description, and units of measure. The poll rate is synchronized with the data logger's execution interval, allowing the values to be updated as they are measured. PC294 software is provided with the CD294.